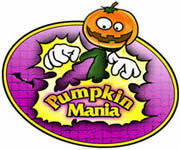 Pumpkin Mania Game - Wipe out pumpkins in this new puzzle game with a Halloween theme. While the pumpkins may be seasonal, this game provides hours of challenging fun all year. 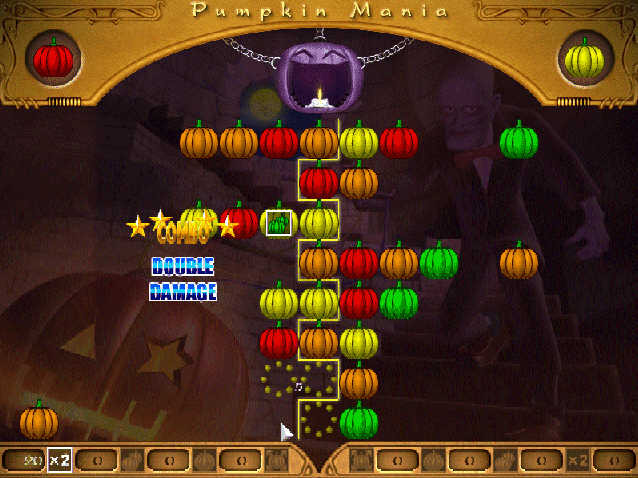 Pumpkin Mania Game - This is a brand new puzzle game with a halloween theme. The aim of this game is to put the pumpkins together and destroy them. You put the pumpkins by shooting them from the sides of the screen. In single mode you play by yourself, and each time you have to fire both from the left and from the right simultaneously! 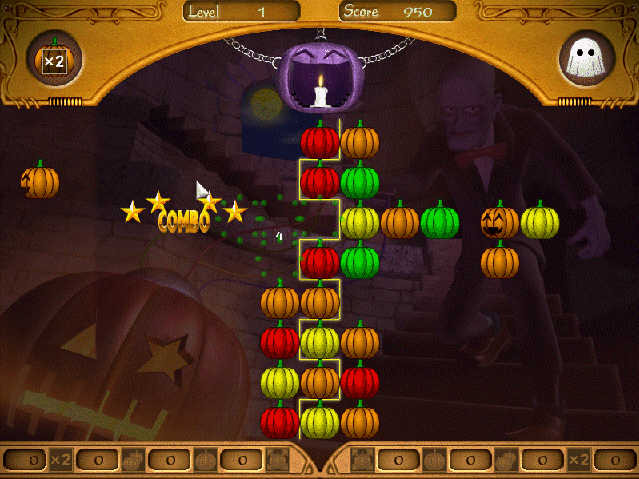 If you just concentrate on one side and forget the other, the pumpkins on the other side will soon go out of the screen and you will lose! There are a number of special types of pumpkins, for example, the wild pumpkin can form a group with any other pumpkins; a fork pulls the entire row one step backwards. Play the game to find out more! Some pumpkins may bear items which you can use. If you destroy a pumpkin containing an item, you can use it for a period of time, you can have double scores, double pumpkins and so on. Feeling bored playing by yourself? No problem, there are Battle Mode and VS Mode for you to compete with the computer or your friend! Instead of destroying pumpkins blindly, you have to create large groups of pumpkins or combos in order to throw more pumpkins to your opponent's side! In the trial version of the game you can only play 5 levels in Single Mode and 1 level in Battle Mode, also you can play VS Mode only in the full version. Jigs@w Puzzle - A truly realistic jigsaw puzzle game which has everything you need to create and play great-looking daily jigsaw puzzle games!